On the back side of Guatemala, coming from Belize, the state of Petén is known as the “last frontier”. Until the end of the Guatemalan civil war, the road wasn’t even paved. The journey to Tikal was then a grueling 20+ hour ride by chicken bus from Guatemala City. 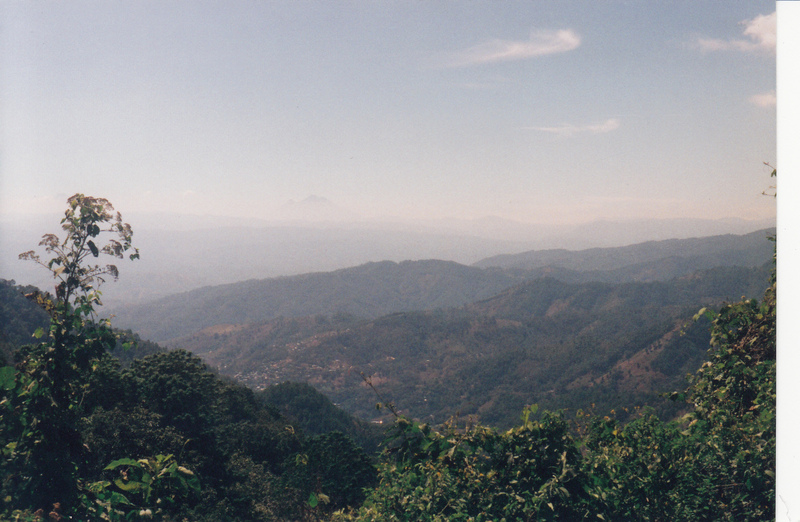 At one time in the past, the Germans offered to pave the road if Guatemala would promise to preserve the rain forest, which was at that time pristine. But the deal fell through. Later on, someone else (Weyerhauser?) paid to pave the road from Santa Elena to Rio Bravo, while clear cutting most of the forest. Now there are evergreen seedlings interspersed with cornfields. Hillsides are still green-green, but the wild tangle of forest is gone. We soon made our way to Finca Ixobel, a hidden gem of a low-key retreat. Staffed by young travelers working to pay for their stay, the ranch has a system where you run a tab for food and drink, for horseback riding or caving trips, for internet use. There was an international flavor to the place, with Spanish being the primary spoken language and Q’eqchi coming from the kitchen. American rock music blared, someone shouted in German during a game of ping pong, and novels in French, German, Italian, Portugese and Spanish were available to trade in. 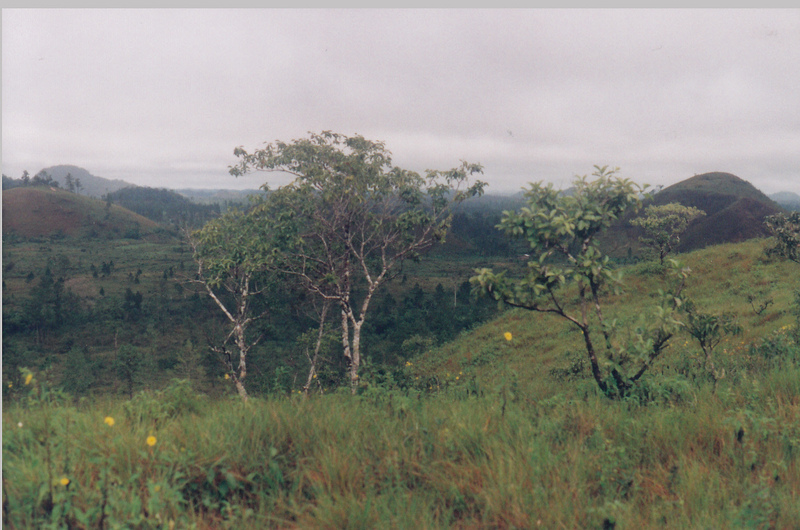 Finca Ixobel had unwittingly become involved in the Guatemalan civil war, in a story which ended badly. Once upon a time, in the idealistic 1970s, a young couple from the United States bought 1400 acres of land in the rural jungle of Guatemala. The “back-to-the-land movement” was in full swing and Carole and Michael DeVine wanted to live it in Petén. The couple raised two adopted Mayan children, kept chickens and pigs and goats, grew vegetables, baked bread, and built a cabin. When adventurous travelers stopped by, they began serving simple home-cooked meals and providing places to camp. This hospitality eventually morphed into an Eco-tourism business which still exists to this day. On their little slice of paradise, the DeVines made uneasy peace with the occupying Guatemalan army and tried to ignore drug smugglers and leftist rebels operating near their ranch. But in 1991, the unthinkable happened. Michael DeVine was kidnapped and murdered on the road from town to his home. His wife and kids demanded answers but got none. Five years later, it was revealed that the man who had commanded the nearby Guatemalan Army post and had ordered DeVine’s murder was actually a paid informant for the U.S. CIA. But nobody was ever arrested or tried for DeVine’s murder. After several peaceful days of rest, we left Finca Ixobel with its fresh baked bread and sad history and continued on deeper into the wilderness. Evidence of the Guatemalan civil war, which ran from the 1960s through 1996, was everywhere. We saw it in the lack of males of a certain age. 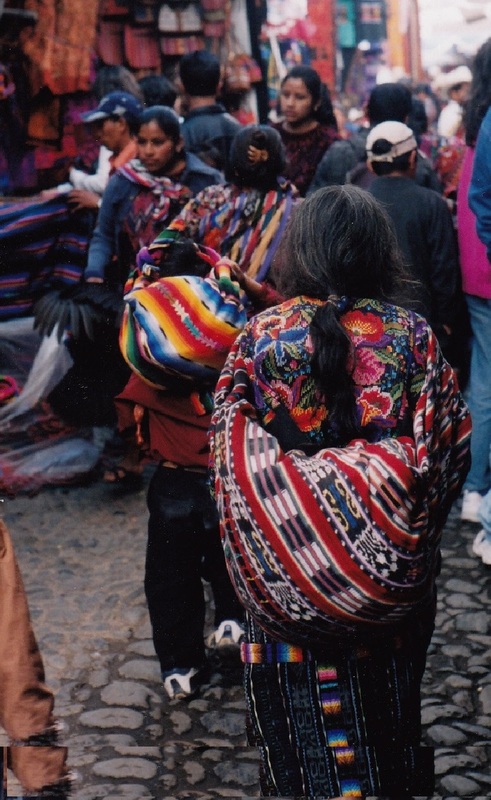 Some 200,000 Guatemalans rebels, most of rural, Mayan heritage, were killed during the years of the war. We saw it in the eyes of the women, who trudged uphill carrying huge baskets and water jugs on their heads, but wouldn’t meet our eyes. They had that vacant thousand-yard stare, the same one guys had after a tour in Vietnam. We also saw it in the coffee plantations, places optimistically begun as co-ops during the war, but now surviving only as subsidiaries of the Nestlé or Kraft companies, after the Guatemalan economy tanked. In our camper we followed a road into a cloud forest. The paved road disappeared after about twenty miles. In its place was a narrow, bumpy, one lane road. Eventually, hidden in the highlands, we located a place someone at Finca Ixobel had told us about. Gruta de Lanquin is an extensive limestone cave. Beneath it, the Rio Lanquin comes rushing out beneath the cave in a burst of whitewater. Unlike the national park caves in the United States, this one provided no escorts for explorers; it was strictly “enter at your own risk.” Inside the cave, lights for the first half mile illuminated paths, steps, and metal or wood catwalks. Signs gave descriptive names of the formations: The Eagle, The Monkey, The Tower, The Sheep, The Femur, and The Cobra. Cave walls were mucky and slimy. It was impossible to climb without holding onto the limestone – a spelunking purist would have been shocked. The air inside the cave was substantially warmer than the air outside, and stuffy. It felt like all available oxygen had been used by the ten or so people who had signed the register earlier that day. When it got dark, we parked by the river to camp for the night. The current was very strong, the water cold and none too clean. A seven year old boy came up to speak Spanish with us. Brian thought he was telling us how some people camped there and got choked or robbed. Then he asked us if we had a gun. Once the kid left with his uncle, we both felt very nervous. We climbed back into the camper and locked the door. Before long we heard another vehicle approaching. Overcoming our quaking fear of being alone in the Guatemalan wilderness without a gun, we peeked out the door. Much to our relief, the vehicle was a VW bus with California plates. Whew! The people, Mark and Nancy, were newlyweds who worked in the medical profession. Their two big dogs were friendly, but we definitely felt better with a couple of canine alarm dogs nearby. They invited us to come sit in their van for a couple hours, to talk and drink herbal tea. Back in my own camper later, I slept soundly that moonless night. And of course, no banditos ever came anywhere near our riverside camp spot. The next day we drove another eight miles farther on a road so steep and narrow that we had to use the 4wd low gear for the first time. It took 45 minutes to reach Semuc Champey, an utter paradise of a place where the thundering Rio Cahabón passes underneath a limestone terrace. 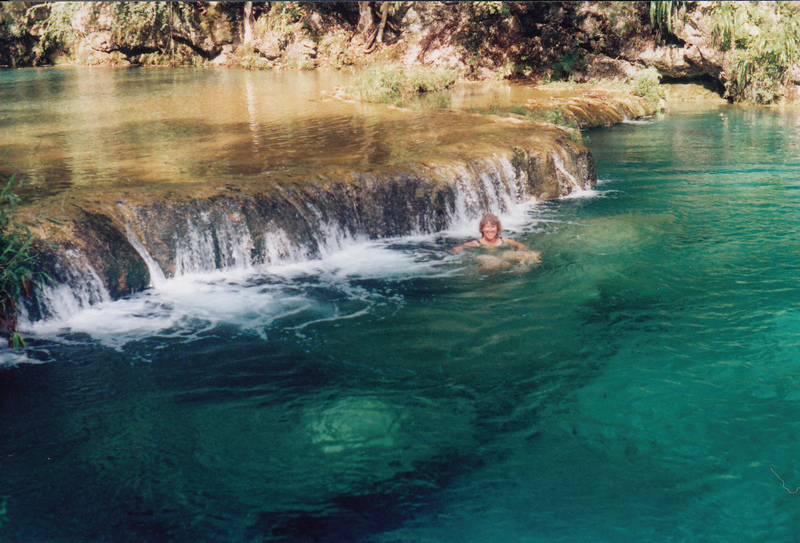 On top were several large turquoise pools, reminiscent of Havasupai, begging to be swum in. Gentle waterfalls tinkled and fish swam fearlessly around my feet. We left before noon and got back on the bad road to Cobán. There we ran into supreme difficulties trying to get more money. None of the ATMs worked, due to the collapse of most of the Guatemalan banks three weeks earlier. Apparently the post-civil war economy was still in shambles. The problem (as we understood it with our kindergarten-level Spanish) was that the country had ordered all new bills to be printed in France, then taken the old currency out of circulation. But something went wrong with delivery of the new bills to Guatemala. So, there was no money to be had. Belatedly, I wished I had followed Brian’s suggestion to take some travelers cheques on the trip. At the time, I had prevailed in that argument: “No one uses those anymore!” Of course, in Cobán, he could not resist saying “I told you so.” But that didn’t help us get quetzales. Eventually I had to run a charge against my Visa card to get some cash, a most expensive undertaking. I looked daggers at Brian when he opened his mouth to gloat; he took the better part of valor and said nothing further. Camp that night was a visually peaceful but noisy little place called “Holanda” that offered a restaurant, pool, lake, and cabins. Right next door was the source of the noise: a farm yard with chickens clucking, cows mooing, white geese honking, and a dog barking late into the night. We tried a “short cut” to get down out of the mountains, which turned out to be a, shall we say, scenic route. After Salamá, the road narrowed to one lane, the outside lane having literally fallen off the cliff. At Rabinál we walked through the market and purchased some tomatoes, avocado, peanuts and oranges. The road out of there was marked as all-weather gravel on the 25 year old map I had. Naively I thought it must be paved by now. But no! I hadn’t factored in the effects of 35 years of civil war on the country’s infrastructure. The track we had chosen ran for 50 miles, all of it narrow, bumpy, and steep. The route went over the top of the Sierra de Chuacus, nearly 7000 feet in elevation. Just past the summit, a little stream tumbled down an almost vertical hillside. Pine and tropical deciduous trees vied for space on the steep slope. We headed downhill through several small villages, populated by very traditional-looking women wearing colorful embroidered blouses and ankle-length skirts, their long black hair in pony tails. 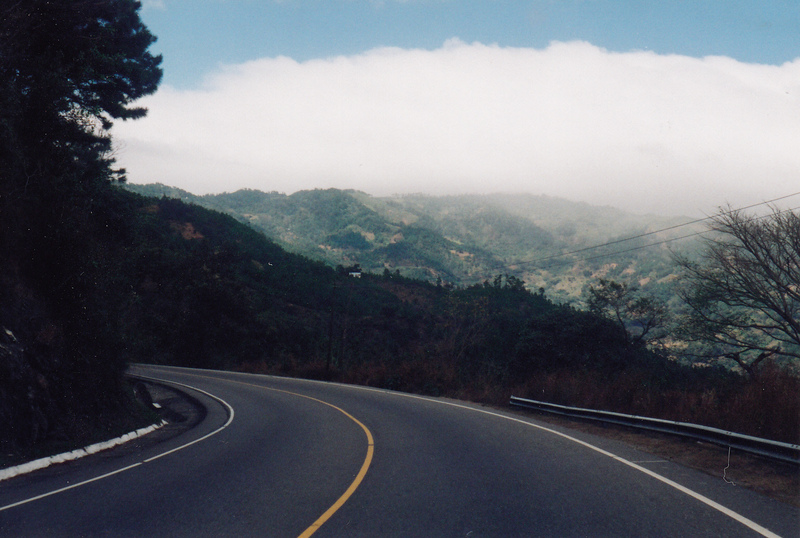 We crossed the Rio Motagua, then around a hairpin curve we suddenly were deposited – boom! – into 21st century San Juan, just 15 miles from Guatemala City. Talk about culture shock! From one-lane dirt roads to eight lane chaos. Busses belched black exhaust, traffic crawled along at a snail’s pace, everyone honked and cut in front of each other. Brian exhibited a mastery of driving skills to negotiate through Guatemala’s largest city. At last I spied a directional sign and yelled for him to turn right. And like magic, we were swept out of the city and on to touristy Antigua, leaving the wild highlands behind.